Influenza B can cause respiratory and stomach symptoms. It can be easily treated. Vaccine and staying away from virus can prevent it. Influenza or the flu refers to a respiratory infection that can be caused by a variety of viruses. The virus will move through the air and become inhaled through the mouth or nose. Approximately 5-20 percent of people catch the flu each year in the United States. Influenza can cause a serious infection or death in newborns, the elderly and people with some chronic illnesses. The viruses that cause influenza are classified as A, B or C types, depending on how their proteins are composed. Type B viruses are the most common in humans. All flu viruses travel in the air as droplets of moisture. It spreads when people talk, cough or sneeze, releasing this moisture. Some people inhale this moisture in the air while others touch objects like a keyboard or telephone that are covered in the virus and then transfer them to the eyes, mouth or nose by touching these areas. The influenza virus alters and creates new strains constantly so those that have already been affected by the flu may have developed antibodies to ward of a specific type of flu virus. If you are exposed to a virus in the future that is similar to those you have experienced before or you have been given a vaccination against a certain type of flu, it will be easier for the body to fight off the infection. The antibodies a person has developed will not be able to prevent an infection caused by new strains of the virus or subtypes of the virus that are different than those you have already been exposed to. A common sign that someone is developing the flu is fever. Fevers caused by this virus can climb as high as 106 degrees F, though this particular type of fever tends to be less severe than other types. 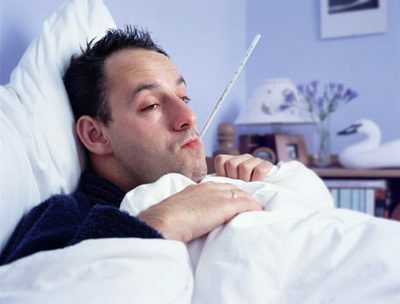 Adults also tend to experience lower fever than children when they are infected with the virus. Those infected with this type of flu will also commonly have fatigue and body aches. As the fever subsides, cough, runny nose and sore throat will become more common. In some cases, these symptoms can become worse, eventually developing into pneumonia or bronchitis if the symptoms are not treated. In most cases, respiratory symptoms will disappear after a week, though it is possible for the cough to last for several weeks. Many strains of the condition will cause irritation in the stomach. Because this is so common, this particular type of flue is often referred to as a stomach flu though the virus does not specifically affect the stomach. Stomach symptoms include nausea, loss of appetite or vomiting. Bacterial pneumonia. Pneumonia is one of the most common complications that stems from an infection. This virus damages the lungs which can restrict the airways and increase the risk of developing an additional bacterial infection, including pneumonia. Pneumonia is caused by bacteria increasing rapidly in the airways, causing fluid retention, inflammation and swelling of the lungs' air sacs. If the lungs start to fill with fluid, it can make it hard to breath, causing shortness of breath, chest pain, coughing and fever. This is a serious concern for those with chronic illnesses or elderly people. Encephalitis. This is a rare condition that is caused by the brain becoming inflamed due to exposure to the influenza virus. This condition is signaled by headaches and fever which will develop into confusion, drowsiness, seizures, loss of consciousness or coma. Myositis. Myositis largely impacts children, causing muscle inflammation or tenderness in the legs. This inflammation can make it difficult to move or lead to muscle weakness as well. These symptoms typically last around 1-5 days. Reye's syndrome. Some children and adolescents can develop this neurological disease that causes delirium, nausea, vomiting or confusion. In some cases, this syndrome is caused by taking aspirin to help manage influenza symptoms like fever. Talk to your doctor before giving aspirin to an underage patient to make sure it is safe. Others. In addition to causing more serious complications, the respiratory symptoms associated with this virus may cause bronchitis, sinus infections or ear infections. In most cases, there is no need to administer medication to those suffering from the flu. If necessary, antiviral medications such as zanamivir or oseltamivir can be administered to help shorten the duration of the illness or to lower the risk of additional complications developing. Oseltamivir is taken orally and zanamivir is administered with an inhaler like you would use asthma medication. These medications can cause side effects including vomiting. Oseltamivir increases the risk of self-harm or delirium in teenagers. Fluids. Drinking plenty of beverages like juice, water and warm soup can help prevent dehydration when suffering from the flu. Make sure you drink enough to keep your urine a pale yellow color. Rest. Make sure you get plenty of sleep to encourage your immune system to fight the infection. OTC pain killers. Pain relievers like ibuprofen or acetaminophen can help manage the body aches associated with the flu. Aspirin should not be given to teens or children as this increases their risk of Reye's syndrome. Flu vaccine. Every year a new flu vaccine is developed that contains the antibodies for the strains of flu anticipated to be prominent that season. These vaccines are commonly administered as a nasal spray or injection. Avoiding spreading virus. While there is no way to completely prevent the flu, there are steps you can take to prevent spreading it to others. Wash your hands, scrubbing them for 15 seconds to rid your skin of traces of the virus. Alcohol-based hand sanitizer is also helpful in keeping the skin clean. Cover the mouth and nose when you sneeze, but use a tissue or the inner portion of the arm instead of your hand to avoid getting the virus on your hands where it can be spread. Try to avoid crowded areas like public transportation, child care centers or office buildings during the peak of flu season to avoid coming in contact with the virus.